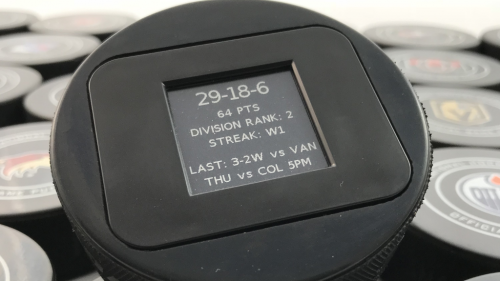 Lehi, UT, United States - March 28, 2019 /MarketersMedia/ — The Smart Puck, the revolutionary new smart hockey merchandise that automatically tracks and displays a fan’s favorite team’s stats, is live on global crowdfunding platform Kickstarter and raising funds to bring the project to life. The Smart Puck is the only piece of hockey merch that automatically tracks a team’s stats. Connect it to WiFi, charge it up, and it will update with a fan’s selected team’s latest stats after every game. It works with any of the existing NHL teams and will support new teams in the future. "Static merchandise is the same for every fan. There is nothing unique about it other than it might have your team name or logo on it. Our StatFeedr™ technology gives us the ability to fully customize each piece of merchandise with a fan's preferences. This allows us to create an experience that is unique to every single fan. Nothing else on the market is capable of doing that,” says founder Kevin Sidwar. When ordering a Smart Puck fans will select their favorite NHL team. Before the puck arrives, the patent-pending StatFeedr™ technology that drives your puck is configured so it will start receiving stats as soon as it connects online to a local WiFi. Once finished, the StatFeedr™ system will update the puck immediately and then again after every game played. 12D Sports Inc. is a tech startup based in Utah. Founders Brian Sidwar and Kevin Sidwar lead the company. Brian is an entrepreneur and business owner with a background in business start up. Kevin is an electrical engineer with over 15 years experience as a software developer with some of the biggest names in the tech industry. They joined forces with a vision of changing the sports merchandise industry forever. The Smart Puck is just the beginning. Their goal is to introduce their StatFeedr technology into every form of merchandise available and help fans of all sports take their love of the game to a new level.